Here you'll find maps and other important details about our training sites and meeting locations. For quick access to a page, use the list of sites below. The last couple of miles into Cutter can best be described as rugged, be sure to look at Street View from here so you know what's in store. Most passenger cars can do this road, if you are careful. More information on the park, its trails and the surrounding area is available at the Bay Area Hiker site. 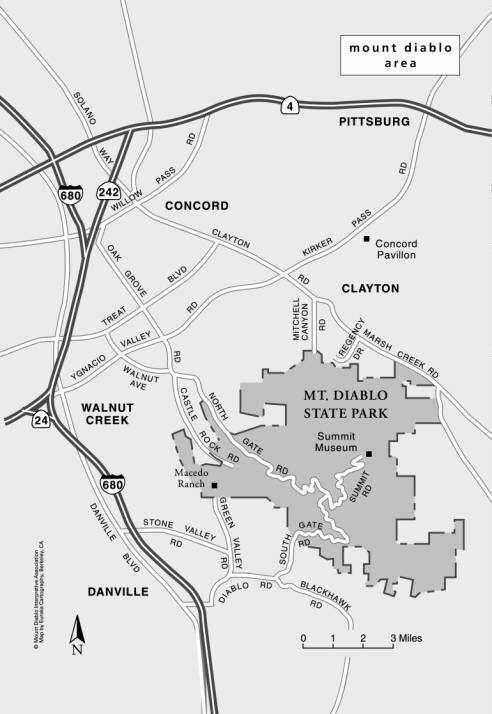 There are also lots of topo maps of the area. Weather information below is for Morgan Hill, which is the closest town. Use the map below to get you to the approximate location; the address in the box differs from the official address, but it will get you closer to where you want to be. When you get close, watch for the signs for the park, and go to the Parking Lot at the Main Entrance. Watch for Cal-ESAR signs! Look at the satellite view and street view for more details. Mount Diablo is a frequent training location. On the plus side, it has lots of variety, great views and an extensive trail system that something for every type of problem. For challenges, there are plenty of rattlesnakes, ticks and other critters to make things interesting. And it can get VERY HOT; be sure to check the weather forecast gadget below and plan your supply of water and sunscreen accordingly. The map below is for the BBQ Terrace Group Campground, this is our preferred location for training. When you first come in the door, there is a open space meeting area on the right; chance are that's where we'll be.